A mounting device offers a safe and secure mount for cable tie, which is available in either screw mount and self-adhesive mount. This product is designed to hold heavier cable bundles, and offer easy and flexible installation with 4-way entry. Besides, it provides a very high pull-off force for the cable bundles attached on it with specially-developed adhesive. Our Functional Hardware collections are a reflection of our continuing interest in bringing you the latest selection of high-quality and innovative products. No more floors covered with intertwined cables! This cable clamp for mounting under work surface will make powering your equipment a snap. 1/2-inch Ultratite Flex Conduit Type NM 25Ft Length.For the installation and protection of electrical conductors in circuits of 600 volts nominal, or less. Motor circuits - for conductors of motor feeders, branch and control circuits. Where the conditions of installation, operation, or maintenance require flexibility or protection from liquids, vapours, solids, or weather. Used in industrial and commercial applications for conveyors, blowers, cranes, air conditioners, machine tooling and lubrication equipment. Exposed or concealed installations. Applications requiring movement, crossover connections, or tight bends. For direct burial and encased in concrete. For flexible connections to swimming pool, spa, and hot tub motors per NEC 680.21(A)(3) & 680.42(A)(1). Electric signs and outline lighting supply and secondary-circuit conductors per NEC 600.7, 600.31(1000 volts or less) & 600.32(over 1000 volts). Superior electrical cable with copper electrical wire for residential electrical wiring projects. 6 AWG Romex SIMpull NMD90 with Freeze Flex includes 3 copper conductors and one ground wire. Use it for electrical wiring between panels in condominium construction. Romex SIMpull features Southwires NoLube SIM technology which has revolutionized the way wire is pulled into conduit without any pulling lubricant, saving contractors both time and money. Romex SIMpull NMD90 electrical cable pulls 50% easier, is tear resistant, reduces burn-thru and strips easier. Freeze Flex gives you more pliability, easier stripping and added crack-resistance in cold weather. 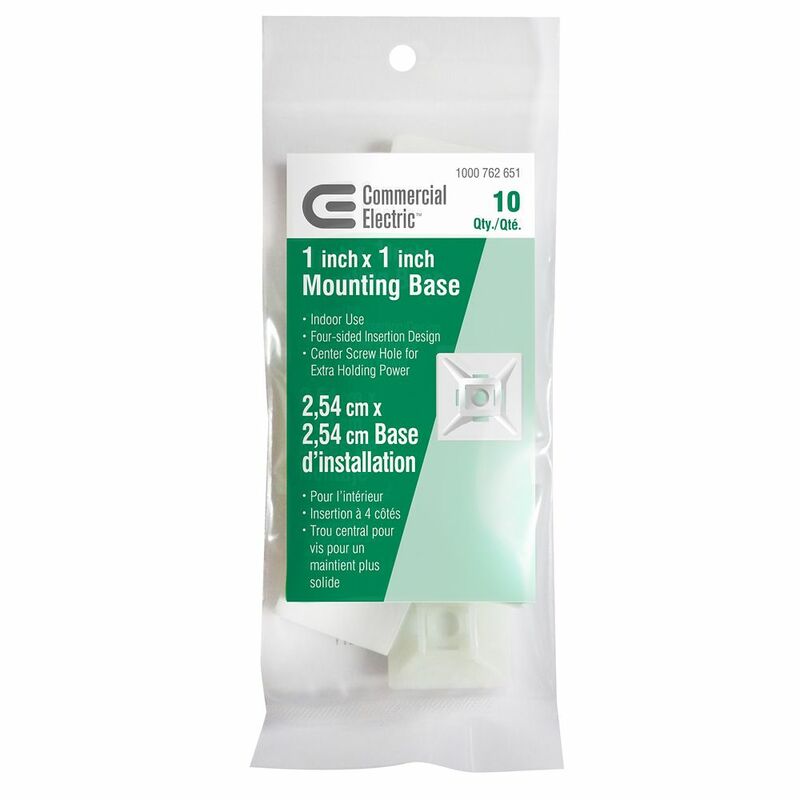 1-inch Natural Mounting Base (10-Pack) A mounting device offers a safe and secure mount for cable tie, which is available in either screw mount and self-adhesive mount. This product is designed to hold heavier cable bundles, and offer easy and flexible installation with 4-way entry. Besides, it provides a very high pull-off force for the cable bundles attached on it with specially-developed adhesive. 1-inch Natural Mounting Base (10-Pack) is rated 4.5 out of 5 by 219. Rated 5 out of 5 by HomeDepotCustomer from Great price and easy to use.... Great price and easy to use. Rated 5 out of 5 by HomeDepotCustomer from Good quality. Did the job. ... Good quality. Did the job. Rated 1 out of 5 by Ties from They were the right suze but the ones on the... They were the right suze but the ones on the shelf were dry rotted. Rated 4 out of 5 by Von from Someone at the factory can not count as there were... Someone at the factory can not count as there were 99 and not 100 in the bag. Rated 4 out of 5 by Wd8lee from As with most zip ties, they work well but time... As with most zip ties, they work well but time will tell as these are suppose to be UV resistant. I bought these because they will be outdoors and I wanted to make sure that they didn’t degrade overtime with the sun’s UV rays.